Certain health services can be greatly enhanced via telemedicine. For example, home health services are receiving a great deal of attention and investment in some provinces. Telemedicine technologies enable home health providers to redefine patient treatment plans, as they are able to increase patient visits due to elimination of a significant percentage of travel to patients' homes. Rural patients can now have access to specialists. Telemedicine helps provide service locally so people don't have to travel out of the community for care. Spending on healthcare is an especially significant portion of any economy, especially rural economies. The more of those rands that can be kept locally the better off the local economy will be. Standard economic multiplier effects also apply here -- any money spent locally ripples through the local economy. Telemedicine provides the capability to deliver clinical services in the community. Locally available quality health care and quality schools are two important factors in the recruitment of new businesses, especially for businesses in rural communities. So there is a potential business recruitment and retention factor to consider. There is a severe shortage of medical staff, particularly nurses, in rural hospitals. At the same time there is high poverty and unemployment in our rural communities. One way to address that problem is to equip local healthcare facilities with advanced telecommunications services for telemedicine purposes and then to appropriately share the videoconferencing capability in a partnership with educational institutions to train more local people for the jobs in health care that are available locally. Local jobs for local people could be a significant economic impact particularly for people who could not afford to travel outside the community for training. Use of telemedicine can have a significant impact on individual health and can therefore favorably impact longevity. The value to the economy of improvements in life expectancy is about as large as the value of all other consumption goods and services put together. It is an intriguing thought to contemplate that the social productivity of health-care spending might be many times that of other spending. Clinical trials represent a multi-billion dollar business that could apply telemedicine technologies to extend the reach of clinical trials to include provider and patient participation from rural communities. Access to quality, state of the art health care in underserved areas, such as rural communities, is one of the most important promised benefits of telemedicine. Rural residents are not second-class citizens; they deserve access to health care services that those in metropolitan areas enjoy. 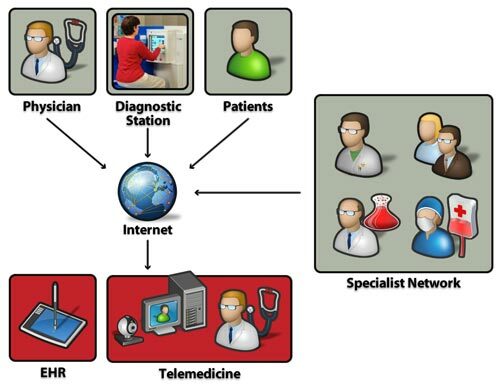 Telemedicine entails moving from a service delivery system in which patients (and often parent or guardian) physically travel from a rural area where they reside to an urban area to consult with a medical specialist, to a system in which the specialist consults with the patient and rural primary care provider using telecommunications facilities. An obvious opportunity is the potential for transportation cost savings, such as the potential for saving a portion of the millions spent annually on patient automobile travel expenses, emergency air evacuations or other forms of transporting patients across the large expanses of rural Africa. Home care and community based health services are becoming an increasingly important part of the healthcare service continuum. There are many reasons for this including: patients are leaving hospital sooner and need some additional care at home while they recover, treating patients at home is less expensive than treating them in the hospital, many patients prefer to stay in their homes as long as possible before moving onto a higher level of healthcare service, e.g. nursing home, hospice. A research project found that telehome care allowed home care nurses to "see" more patients in a day, decreased the visit time and ended up costing 33-50% less than the traditional home care visit. Improved collaboration between providers (e.g., shared access to electronic medical records and provider to provider consultations) provides patients with enhanced confidence that all that can be done is being done. Television and computer applications are more common and not a foreign concept. Patients are now more at ease and accepting of the use of this application of technology.